Are you looking for the best powered speakers? With the large selection of powered speakers, you can find online, deciding which one to choose can be quite tricky. Add the fact that the market is diluted with a lot of low-quality speakers, selecting the right one for your intended purpose can be troublesome. But here's the good news! To help you end up the right type of speakers for your gig, we have narrowed down the selection to eight of the best and most versatile powered speakers you can buy. Powered speakers can be quite expensive. Well, there are cheap models you can see advertised online. Sometimes, the prices are too low and can persuade you to choose them over other better-quality speakers. However, most low-priced speakers have some issues you have to deal with Some of these types of cheap and low-quality speakers don’t last long! The price can lure you to buy them, but imagine what happens if those speakers give up on you in the middle of the party or an assembly? Yikes! So, here are 8 of the most sought-after powered speakers that have great sound -quality and reliable durability that you can find in the market. We carefully selected these models to match the specifications you need and provide you with a wide selection of functionality. Audioengine specializes in customized audio equipment that many users have loved. Dave Evans and Brady Bargenquast, the co-founders of this company, have a combined experience and mastery of crafting superb equipment they have learned from the biggest consumer electronics company in the world. They don’t just make speakers and other audio gears for profit, they aim to deliver an excellent audio experience that their patrons would be satisfied with. This product weighs more than it looks at. Its 2.75-inch woofer is packed in a tight enclosure that spews 60watts peak power. They take pride in the materials they use. Every speaker fitted on each unit is custom-built and not a product of sub-standard manufacturing. This product can send a signal to other wireless-enabled devices to extend your music. This product comes in satin black, high gloss red, and high gloss white. • This product is loud for its size. • It comes in stylish design and color. • This speaker is crafted by hand to deliver superb audio quality. • It has a nice weight to it that would not easily flip over. • It can send a wireless signal to other W3 enabled devices. • This product does not come with a subwoofer. • This speaker is not Bluetooth enabled. • This model is quite pricey. This product is intended to provide you superb entertainment on your pc or laptop. These compact speakers can give you remarkable audio experience in a small office or your bedroom. This can also play great ambient music at in your living room to keep your guests entertained while hanging out or having dinner. It works with all kinds of devices that utilize a 3.5mm mini jack. You can attach an external subwoofer to it give augment and give your music a deep bass response. Pyle was founded in the 1960s and known for their superb sub-woofers that bring out ground-shaking lows. They started out with PA systems and shifted to home audio in the 20th century. Seeing that they have potential in fitting car audio system, they broadened their product selection and started creating remarkable car audio systems. Using their expertise in making great sounding sub-woofers, they found success in every field they chose. This product is advertised as a multi-functional speaker that caters to your everyday needs. This product is equipped with 4-inch woofers that give clear and defined bass lines. It features their newly designed “Eagle Eye” dome tweeters that deliver rich and satisfying tunes. You can pair your mobile device with it through Bluetooth connection and directly stream music from your gadget. It also has two auxiliary inputs (3.5mm jack and RCA) that expand its mode of use. It comes with a remote control for convenient adjustment. It boasts a 66watt RMS that will give you loud and clear music on demand. These speakers are enclosed on a wood-style cabinet that sits prettily on your desk. Finally, it comes with a two-year warranty in case your unit encounters some problem. • This model is Bluetooth enabled and can readily stream audio from your mobile device. • This speaker set has two auxiliary input. • This product comes with a two-year warranty. • These speakers are perfect studio monitors. • This speaker set is quite expensive. • This cabinet is not made of real wood. • This speaker does not come with a sub-woofer and lacks some bass response. 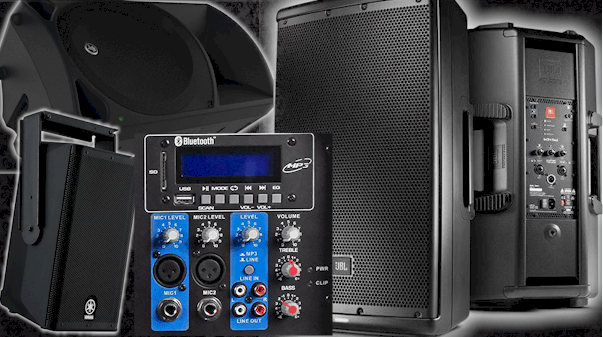 For years, Rockville has manufactured and delivered great sounding speakers for a wide variety of usage. This company promises to give you the best value for your money and gives a 90-day money back guarantee. If you are not happy with the product you bought from them, they will willingly replace it or refund it for you. Don’t let their pricing fool you. Although they are inexpensive compared with the top brands, they strive to be on par with them. This product is fitted with two 12-inch speakers with a maximum power rating of 1000watts. Each set comes with a 6ft durable and adjustable stand, one wired microphone, speaker cable, instrument cable, and remote control. This model can play music via Bluetooth or USB. This gives you the convenience music from your mobile device. With 500watts RMS, you can use this powered speaker system for parties, karaoke nights and other events. • This model is inexpensive for the quality you get. • It comes with durable stands that can extend up to 6ft. • The company offers a 90-day money back guarantee if you are not satisfied with these speakers. • This set comes with a microphone and instrument cable. • You can play music using a thumb drive or via Bluetooth using your mobile device. • This model can handle continuously play at 500watts power for hours and can handle up to 1000watts. • This model is quite heavy. • It takes quite some time to set and pack this up. This speaker set is great for parties and assemblies. You can use it at one of your karaoke nights, and your friends and guests will surely have fun. If you are hosting an event, these speakers, along with the mic included can help you deliver a great speech. You can conveniently play music through your mobile device with this speaker set. However, it’s heavy and setting it up can be a little of a chore. James B. Lansing founded this company in 1946. The company manufactures two distinct product lines. One is designed for home, and the other is crafted for professional use. They found success in both product lines and later manufactured speakers that fit different categories such as car and marine audio. Today, they are one of the best-known brands that deliver a great quality product you can find on the market. This 12-inch speaker packs 500watts RMS in this single powered speaker. It is fitted with four handles for easy handling and transport. It has a 5-dial parametric equalizer that can help you find the right mix for every type of event you will be holding. It comes with a Bluetooth enabled configuration that lets you tweak your equalizer on your mobile device. This product is housed in a durable wooden enclosure that prevents damage due to humidity. • This one-piece speaker spews up to 1000watts of power. • This product can be configured through Bluetooth integration. • This model has a 5-dial parametric equalizer that can help you tweak and find the right mix for every event. • This speaker is made of a known brand. • This product is quite heavy. • The price of this product is a little steep. • Does not come with accessories. This model can qualify as the best portable speakers that can provide you with excellent party music. Although it’s a bit heavy, it’s size is still small for a 1000watt speaker. These will surely give life to the party and karaoke nights. It’s easy to set-up too. Just plug it into a power source, and you are good to go. This model can be mounted on a tripod you can avail separately from JBL. Mackie is a known brand that manufactures a wide selection of audio equipment the delivers superb quality. Many celebrities, bars, restaurants, churches, and other assemblies favor Mackie for their clear sound projection. Mackie delivers not just loud sound, they manufacture top-notch speakers that deliver an amazing musical experience. This 15-inch powered loudspeaker packs 1000watts peak performance. It operates effortlessly at 500watts RMS. You can crank up the volume and hit the peak power without distorting the sound quality. This speaker brings an astounding bass and excellent mids that will surely give life to the party. The enclosure of this speaker is designed to tilt in an angled position to project sound better on large halls. This model can be mounted on durable tripods for better sound experience on large and open spaces. • This enclosure of this product is well thought of and can be easily set up at an angle without any accessory. • It packs 1000watts of peak power performance without distortion. • This speaker has a large subwoofer that gives excellent bass outputs. • This model has a three-band equalizer that lets you add and tweak some trebles, mids, and lows on demand. • This product has a steep price. This unit spews great sounding music and remarkable bass. With 1000watts of peak performance power, your party music will be loud and clear even in the outdoors! This model has a microphone/instrument input that adds up to its value. However, it doesn’t have Bluetooth connectivity for your playlist’s easy access. Behringer is a renowned audio equipment manufacturer that was identified as the 14th largest supplier of audio equipment and other music related product in 2007. Until today, the name Behringer is something every musician or audio technician is very familiar with. This company was founded in 1989 and have since vowed only to create and manufacture the best audio equipment that will satisfy every audiophile’s standard. This model is a high-power 2-way PA system that delivers remarkable audio quality. This unit is fitted with a 12-inch woofer that spits ground-shaking lows. This speaker system can run on 550watts without signal distortion. It’s made of light and sturdy material to help facilitate easy transport. This model can accommodate up to two microphone/instrument inputs. • This speaker system is made by a well-known brand that is most notably recognized for the quality of their build. • Behringer made this unit with durable and light materials for easy transportation. • This unit renders powerful deep bass. • This speaker has a male and female XLR input, and a microphone input. • This product can be mounted for wider coverage and tilted on the floor as a monitor. • This unit is quite pricey. QSC LLC is an American brand of audio equipment that has been manufacturing top-notch gadgets for almost half a decade. Every year, they supply theaters, churches, assembly halls, and individuals with high-quality speakers. They employ a strict quality assurance and control process to make sure that their speakers and other audio equipment will deliver great quality and will take a beating without leaving your side. This speaker is fitted with a 10-inch subwoofer that projects deep and excellent bass. This model has a power rating of 1000watts RMS. This speaker has a built-in equalizer and multiple inputs that increase its value and versatility. The handles are built ergonomically to make sure that you would not hurt yourself while setting it up. The company is known for great warranty coverage that many users in the past have enjoyed and continuously enjoy to the present. • Great customer relation services and warranty coverage. • This product packs 1000watt that will rock outdoors with clear music that has deep bass. • This speaker is made by a well-known American brand that has provided large companies and establishments with their audio needs. • The price of this product is way above most of its competitors. This speaker is undeniably one of the loudest speakers you can get with a 10-inch subwoofer. The sound it projects is unbelievable for its size. It has multiple outputs that can help you with your performances or duets. This product can be best used in large halls and outdoors. With 1000watts RMS, you can crank the volume of your music high without getting a hiccup. Yamaha is a Japanese multinational business conglomerate that has dominated the audio and musical instrument realm for many decades. Yamaha is one of the biggest and most trusted brands in the world when it comes to consumer electronics, audio equipment, and musical instruments. Aside from audio and other audio related equipment, they also manufacture motor vehicles and other motorized engines. This featured model is equipped with a 15-inch subwoofer and can run at peak performance at 1100watts. This model is fitted with an onboard mixer that controls your audio signal. It has multiple audio inputs where you can plug your microphone or instrument directly. The handles are sensibly contoured for ergonomic use. They are built with light and durable materials for easy transport. This speaker can be mounted on speaker tripods are placed angled on the floor as a monitor. • This product is manufactured by a world-renowned brand that is known to build high-quality products with extensive quality assurance. • The manufacturer provides excellent customer support in case you have some queries. • This speaker projects superb sound quality. • The 15-inch speaker gives out ground-shaking lows. • This price point of this speaker is way above most of the products you can see in the market. This speaker has superior quality and spits remarkable sound. This unit renders the clear and deep music. This is a professional level equipment that is equipped with a built-in mixer and multiple inputs. With its power rating, you can wake up your neighbors when you party with this! For beginners, active and passive speakers may not be all that distinct. Who can blame you? They all look alike! The good thing is, there is the internet, and you can simply google the difference! For starters, passive speakers are generally lighter than the active speakers that house the amplifier. Now, aside from that, there are some criteria you may want to look at to help you establish what type of powered speakers you should get. ​Active speakers require a power source to work. Well, you can’t run a passive speaker without the active unit that gives it power. Before deciding which model to buy, it’s best to define how you intend to use it. A 60watt powered speaker may be more than enough to fill your living room when cranked to its max. However, the same room filled with people may not enjoy listening to it because the noise your guests produce may cancel the output frequency. If you plan on using it at indoor parties, a 500watt speaker may be enough. Now, when we talk about the outdoors, you may need to crank it a bit. However, if you play at max power output for hours straight, your speakers may overheat and start to get distorted sounds. This where 1000watt speakers are great for. In an outdoor party, a higher RMS rating makes sure that you can party all night without worrying about your speakers failing on you. ​Usually, powered speakers come with at least one ¼” jack input for a mic or an instrument. Some may come with direct USB inputs for the convenience of playing audio directly from it. Larger speaker builds come with more inputs and sometimes, an XLR input. So, aside from sending a signal from your mixer, you can also directly plug your instrument or microphone. ​If you have professional needs or you just can’t stand ill-sounding outputs, an onboard mixer can further enhance the frequency your speakers spew. Some advanced models have 5-band equalizers readily built-in for ease of use. Some larger speakers may have this too. But the larger speakers are often hooked up to a mixer where the signal is processed before going to the speakers which make Bluetooth connectivity option trivial. However, on smaller speakers that are meant to be used with your desktop or laptop, this connectivity option is a great addition. The best powered don’t come cheap. Most of the time, they are pricey. The best brands command an insane price over the units they sell. However, once you hear the sound quality of those models, you will never be able to “un-hear it”! It becomes your new standard! Clearly, if you are looking for the best portable speakers for home use, Edifier’s Bookshelf Speakers will serve you well. Now, if you can’t stand mediocrity in any aspect of music play or mixing, no doubt, Yamaha’s Powered Speaker Cabinet is unmatched.